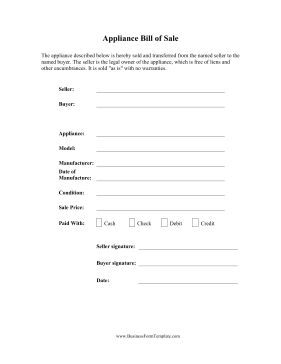 This free, printable bill of sale should be used when buying or selling appliances such as refrigerators, washing machines, or stoves. The appliance described below is hereby sold and transferred from the named seller to the named buyer. The seller is the legal owner of the appliance, which is free of liens and other encumbrances. It is sold "as is" with no warranties.